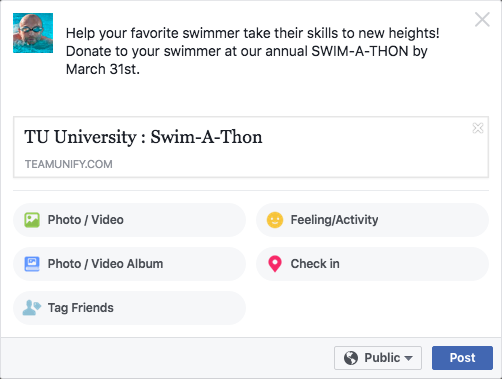 Social media is a great way to promote your TUMoney fundraiser, such as a Swim-A-Thon. Follow these steps to promote your campaign on Facebook. This assumes that your fundraiser is active. Go to your general fundraiser page on your SwimOffice site (click the Please Help banner). Login to your Facebook page. Paste the URL you copied into the "What's on your mind?" (status) box. Delete the URL and replace it with your own promotional ad copy.